The romantic vacation of Ash Williams and his girlfriend Linda turns into a waking nightmare, as their small forest cabin is haunted by unimaginable ancient horrors. Ash must battle demons as well as his own besieged mind to survive. Sam Raimis horror flicks have always had a special place in my heart. 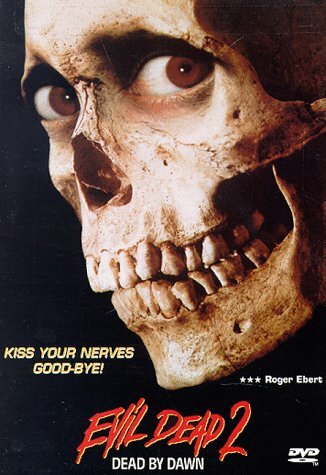 I have a vivid memory of watching my VHS copies of the Evil Dead trilogy on my semi-broken secondhand VHS player connected to my tiny Commodore monitor, the one that oftentimes needed a few taps on its top to prevent the image from going out of sync. This movie and its sequel, 'Army of Darkness', had a mixture of grotesque humour, dense spooky atmosphere, and a horror world packed with crazy creatures, that was perfectly in tune with the way my mind worked. Watching 'Evil Dead II' again, twenty years later, the feelings come back to me. Bruce Campbell's first full-length movie role was in Sam Raimi's first full-length movie, 'The Evil Dead' from 1981. In 'Evil Dead II', he reprises the role of the unwilling hero, Ash. This is undoubtedly Campbell's best work, he shows an incredible range of Jim Carrey-esque expressions, and has great comedic timing in his movement, perfectly suiting the style of Raimis weird close-up cameras. If someone should ever wonder where flamboyant and slightly stupid characters such as Duke Nukem stem from, they had only to watch Ash Williams. 'Evil Dead II' is more of a retelling of 'The Evil Dead' than a sequel. The big difference being that 'Evil Dead II' is a comedy, 'The Evil Dead' is not. It follows the same story beats, but gets the pre-horror suspense out of the way in the first 5 minutes, leaving that much more time for full-on horror, over-the-top creature effects, violence and gore, and some scenes that are indescribably funny. This does not leave much room for a story, which is a classic Lovecraftian tale of men poking their noses in ancient knowledge that should have been long forgotten, invoking unimaginable horrors from beyond, etc. The effects are uncontaminated by computers, its all latex, fake blood, clever editing, and Ray Harryhausen-style stop motion animation. The stop motion animator, Doug Beswick, had previously worked on the miniature unit on 'Star Wars: Episode V - The Empire Strikes Back', animated the Terminator stop motion sequence from the original 'The Terminator', and would go on to do the sandworm sequence in Tim Burtons excellent romantic horror comedy, 'Beetle Juice'. By the way, I can only recommend seeing the trailer for his first movie, the incredibly ridiculous 'Flesh Gordon' from 1974. The sound of 'Evil Dead II' has served as an inspiration for me since I first heard it. The insane creativity and recklesness that went into the creation of the soundtrack is inspiring. There is no subtlety here, only powerful, brutal sound effects, every punch sounds like a thunderclap, every opening door sounds like an oak tree being cut down. Weird gasps and howls emenate from the invisible demons that infest the cabin, and the ancient evil that pursues Ash through the forest is defined by the sound of a thousand deep growling voices whose pitch accompany their rage. Awesome! Evil Dead II is the horror comedy classic, that every fan of the genre should watch, it is highly entertaining and holds up perfectly to the present day.